Rosberg's next lap extends his advantage to 0.370s. yes, Mika and David. at least with the 1998 Spa race, you knew who the culprit was. yes, the teams should have a larger name somewhere on the car to identify a driver more clearly along with the their favored number. @RohanMehta: I think Toro Rosso look very strong. If you take reliability and a botched pit stop out of the equation, Verstappen and Sainz would have had a great weekend. 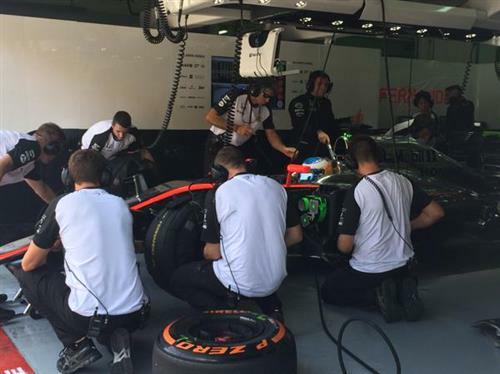 Best time so far for ALO is 1m43.040s - that puts him 11th fastest. BUT's best is a 1m43.222s - 13th. Merhi comes out for a run in the other Marussia. 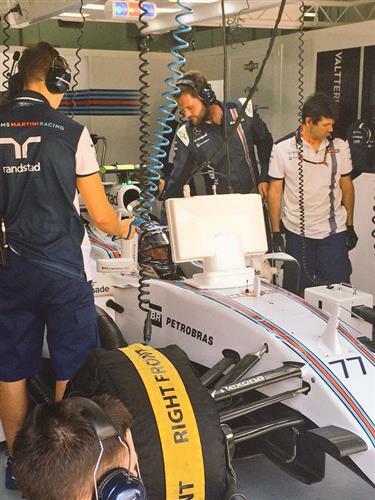 This means only Kvyat and Hamilton are yet to venture out on track. the Renault engine would more likely disappoint the team if Renault have not got on top of their issues. but you can be sure the Merc powered cars would be in the top ten along with the Fereri unit cars. Oh okay... Yeah that is true.. How about Nasr? Keeping in mind, the disqualis and non-participation of other drivers, he could still make top 10 this weekend. What a start for Sauber! @RohanMehta: Indeed. A great start to the new year from Ferrari in general. guessing 15 minutes until Hamilton is on the track. Guess it is Nico's time to win this race as it was Lewis' last time out? @Efranov: Not sure it's that simple! Remember, by winning this race last year Hamilton triggered a run of four in a row. 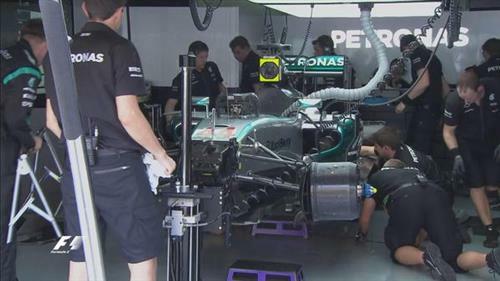 I feel for those mechanics working flat out on Lewis's car in that oppressive heat & humidity ! The garages have a lot of cool air pumping through them. I read the weekend preview and it indeed looks ROS could be on top spot though little early to say as HAM has not had any run. It is just that ROS has not been able to convert as many poles to wins. Hulkenberg leaps ahead of his team-mate Perez but worryingly for Force India that's only for 15th. #Sepang fact: One of the principle places to recover energy under braking is T1. ...Coming directly after the pit straight the driver will brake down from eighth to third gear and just 80kph for the entry of the turn. 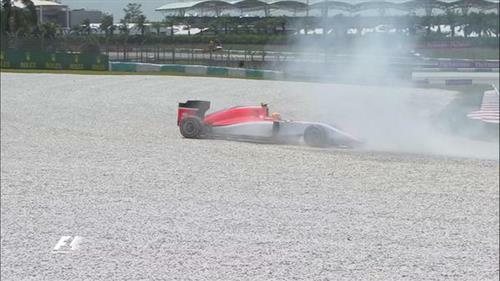 We have yellow flags, and now a red flag, for a Manor Marussia beached in the gravel on the outside of Turn 11. It's Roberto Merhi. That also appears to have jeopardised a qualifying simulation from Vettel, who was not far behind. Seeing an on board it seems Merhi locked his rear breaks and then he just spun into the gravel. Merhi: "I think I spin in the corner ten." Manor: "OK we can see that, switch off the engine." Doesn't appear there is any damage to Merhi's car. Wouldn't read too much on SFI's FP timings. ...and looking back at Malaysia GP 2014, HUL finished an impressive 5th! Hmmm ... Force India showing it's not just the engine that gets results ! Hamilton is having issues, losing so much running time, it could play a role later on. i am more concerned for hamilton then you may think. Ouch. Seems Merhi gave his head a smack on the crane as he stepped out of the car there. So it's al quiet out there as the crane removes Merhi's car. Red flags still out. Merhi is currently 0.072s inside the 107% time. Session will resume in two minutes. The flags are green and Hamilton is one of the first out on track. that picture reads more for me. he must of misjudged his braking.